The results are in: check out the line-up of SAMRU Executives! After a full-throttle campaign for all of the candidates, finally the results were tallied and revealed on March 5 at the Hub. Your SAMRU Executives are SAMRU President Erik Queenan, Seija Roggeveen for VP Student External Affairs, Tristan Smyth for VP Student Academic Affairs and Zoe Slusar for VP Student University Affairs. All of the candidates campaigned hard and the numbers show. This year’s voter turn out percentage was 23 per cent, as opposed to last year when it was 15 per cent — and last year was said to be an impressive tally. The verdict was 2,503 voters. For the position of President, Rhett McLeod gained 728, Norman Potter had 516 votes, Harbaksh Singh Sekhon 231 had votes and the winner was Erik Queenan with over 900 votes. For VP of Student University Affairs, Zoe Slusar won the race with 891 votes. Charlene Green had 780 and Mitchell Parent had 616 votes. 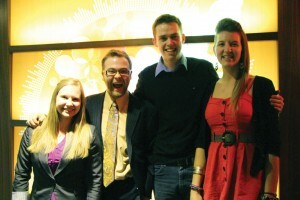 For VP Student External Affairs, Seija Roggeveen came on top with 963 votes. Jesse Beaudin had 657 votes and Will Conner 591 votes. For VP Student Academic Affairs the only person running was former VP Student Academic Affairs Tristan Smyth and in a yes or no tally Smyth gained 1,924 votes for yes and 238 votes for no.